The September meeting was called together by President Jim Cook. Three or the members brought along friends and relatives to make for a good turnout. Reports were given on the great time at the Jamboree and the possibility of us volunteering to host one in 2009. I forgot to mention in the last newsletter that Joe Bell and his family were at the Jamboree. All in all it is one of the best turnouts that we've had from this club. Jack Putnam, treasurer reported on our checkbook balance. One of Bruce Klepinger's friends from Arizona (previously from Ohio) told a fascinating story about traveling all around the edges of the US and Canada in a Model A. The people and places that he experienced along the way was the best part. He was never without a friend or a helping hand when he needed it. The group asked questions and kept the story going for a good fifteen minutes. 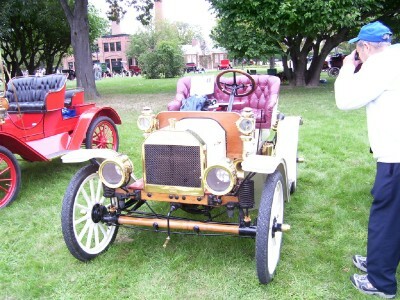 We also mentioned the upcoming Old Car Festival at Greenfield Village. Everyone was encouraged to attend. Those of us that display cars always have a few extra buttons that will get our friends in to see the cars. We always have a great time and lots of fun. We get a chance to talk to a lot of people that we know from the internet or from our travels around this great country. Jim talked about another possible tour of the Tiffin area in October. Unfortunately, with all of the previous commitments, it has been decided that this will not take place this fall. Maybe we can make it the first tour of next spring. 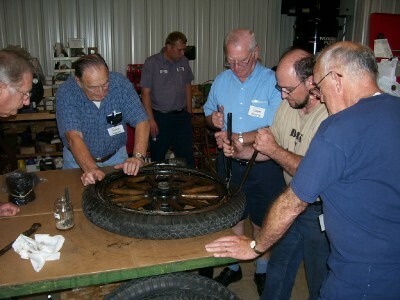 After the formal meeting we all got together to change some tires. Some of these tires had not been off of the rims for 40 years. We always go out on a limb when we ask people to bring in projects to work on. Read further to find out why this took so long. Christmas is coming soon; so, please start thinking about where you would like to have our annual Christmas party. We always like to have it at one of the nicer establishments. The place that we have had it for the last few years has been replaced. As always, thank you Marilyn for the great cake and cookies. They are always a hit. 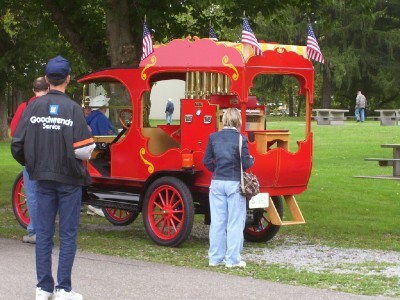 Oddities are most times the rule on the All Ohio Model T Jamboree. This year, these two T's just happened to be parked right next to one another at one of the lunch stops. The car on the left is Bill Sieberg's 1927 Roadster. The car on the right belongs to Jim Tylor of Fostoria. You will notice that both cars have front bumpers. This in itself is rare for a Model T, let alone the fact that they are also both rare spring (shock absorber) type bumpers. One set was made in Springfield, Ohio and I don't remember where the others were made. 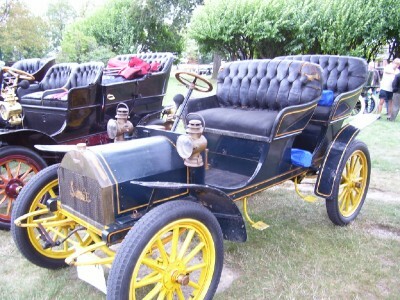 The calliope mounted on a Model T is another fascinating oddity. I can honestly say that if you've heard one Model T calliope for fifteen minutes, you've heard enough. I didn't think about who was in the picture at the time I took the shot; but, it contains a group of unrelated friends. That's Bob Torbet's wife from the NWO group near the keyboard, Brent Mize of the Tickin' T's near the hood and a guy that I know from New Washington keeping his distance. He doesn't have a club. ready to mount the tire. Once the sand was cleared from the rim, it was painted and ready for the old Wards Riverside. I was amazed at how soft this Riverside was. My experience with these tires is that they are usually rock hard. The pictures on this page show the removal of the Riverside with two tire irons. We eventually had three tire irons working at once. The removal only took about ten minutes. The remounting took maybe another five minutes. Everyone learned something from all of this. Greenfield Village was the site of the Annual Old Car Festival. My favorite part about this show is all of the early cars up and driving around. The car to the right is a two cylinder Sunset made in San Francisco. You will notice that it does not have a parking brake lever. This means that it was one of the first cars made. Evidently, a parking brake did not occur to the builder. They did have a lot of climbing power for those west cost hills. They also smoked a lot like a chain saw and didn't have a lot of speed to get away from their own smoke. This car is very original. 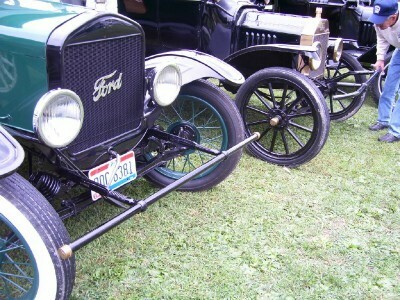 One of my favorite antique cars is the Brush with its solid wood axles. There are always a couple of them at the Old Car Festival. They also have that unique shock absorber that makes the car run so smooth. I like the fact that, even though the Village has a great emphasis on the Ford Motor Company, they still work hard at getting every possible make and model car in existence pre 1930.